I wrote this short essay in June, 2011, for Blue Ribbon Flies. My sentiments haven’t changed. In The Philosophical Fisherman, Harold Blaisdell suggests that happiness can be found wherever foot-long trout come regularly to the dry fly. I’ve always appreciated this sentiment and have long agreed with it. And I think there was a time—not that many years distant—when most other fly fishermen did too. But lately I sense that this has changed. 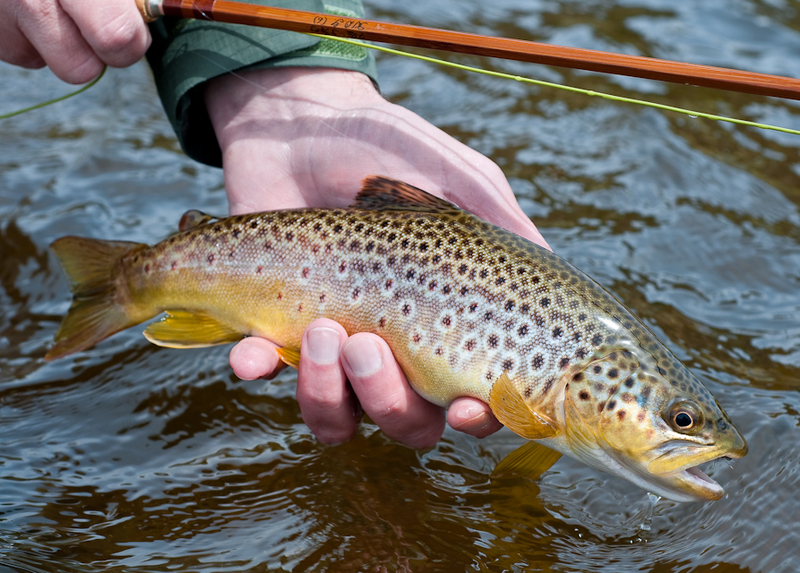 Fewer and fewer anglers I talk with these days seem to appreciate smaller trout. Relative pleasure in angling is becoming a function of fish size, where bigger equals better. I’m a little worried by this development. Now, I know full well that the attractions and charms of fishing lie in the eye of the beholder, especially when it comes to the kind of fish we seek, the methods we use to catch them and, not least, the size to which they run. So I’m not about to pass judgment on anyone whose views run in another direction. It’s just that having engaged in so many conversations about fish size and relative enjoyment, I’m always left to wonder: What’s not to love about foot-long trout? Personally, I can’t think of much. Maybe this diminishing appreciation is merely a byproduct of today’s society. Have we succumbed so completely to the notion (after bombardment from all sides) that “super-sized” should be the essential state of being and that anything less is…well, unworthy of our efforts? I hope not. Maybe it’s got to do with the old saw that things are just bigger in the American West. If so I’m disappointed, because such built-in expectations allow scant leeway for personal interpretation. And while much of the time things really are bigger out here (including the trout), who says it must it always be so? I respectfully suggest that we set our sights a bit differently, at least when it comes to fishing. How about giving due quarter to the actual experience and process of fishing? How about enjoying the unique qualities of each water we fish, and ultimately defining our enjoyment by more than just the size of the fish? I ask these questions because fly fishing is a sport I care deeply about. I ask them because I want 12-inch trout to matter. I was fortunate this week to spend a few days on the Firehole River. Each afternoon I caught rising trout on dry flies, with a fine proportion of them reaching but not exceeding twelve inches. I landed some of the river’s ever-cooperative rainbows, some furtive browns hugging grassy banks, and spooked a good number of both (I presume) from some difficult flat water stretches. In all respects it was rewarding fishing, and the feelings I experienced arose independently of the size of the fish. To me, that’s appropriate. If for some reason I’m ever restricted to fishing of this kind, I won’t complain. Indeed, like Harold Blaisdell, I will have found happiness. And granted one last wish, it would be that the majority of other angler’s feel this same way.